We’ve spent four beautiful months together and created memories which I will cherish forever. I’ve hiked your coastal cliffs, sailed your harbors, explored your neighborhoods, wined and dined in your restaurants, viewed your highest points, and tanned on your beaches. I can’t imagine a better place to spend my first few months in Australia and am forever grateful for our time together. And now, as I reflect back and set my eyes on the future, I think it’s time for us to move on, to see other people and places. Thank you for being the city I’ve grown to love, with my five favorites included below. Where do I begin? You know I love to eat and, even more than that, I love to find the best restaurants in town! From seeking out the best fish and chips in Bondi, to trying the many Italian pizzerias in the city, there was never a bad meal to be had. I may have put on a few pounds because of all the eating I’ve done, but I’m comfortable with it. Sometimes I missed the food from home, like burgers and Mexican (sorry Sydney, you’ve still got work to do here), but I couldn’t walk down a block without finding another great Thai restaurant or a hotel bar offering happy hour drinks and stellar snack options. And then there’s the avocado…you sure do love avo and I love you for it. Smashed avo for brekkie? Don’t mind if I do! Ever since I first started traveling, I’ve loved exploring the neighborhoods of a new city. I’d much rather feel like a local than a tourist and one of the best ways to fit in is to spend time in a neighborhood. Sydney is packed with hip neighborhoods, each filed with its own unique vibe. Glebe was my first sight in Australia and will always hold a special place in my heart. Surry Hills was next with its brownstone homes and hilly streets. I found myself back here several times over my four months. 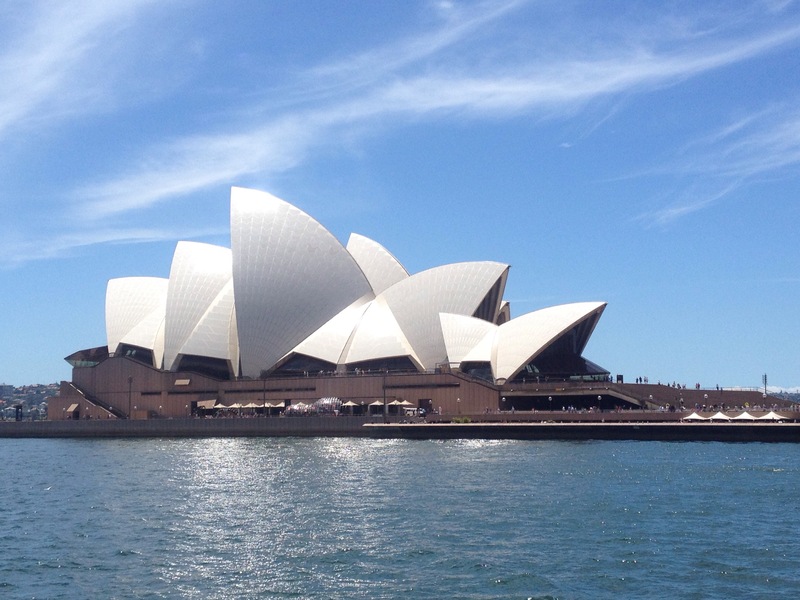 During my first two months in Sydney I lived in sleepy Clovelly, the surfer’s paradise known as Bondi Beach, the historic Rocks District, and in the numerous hostels in Haymarket. Then came Newtown, my home for 5 weeks and my favorite neighborhood in Sydney. Last, but not least, included north Sydney’s Neutral Bay and the laid-back Mascot. Needless to say I’ve lived in many of Sydney’s best and visited many more. One of my favorite moments in Sydney happened while I was on the train. We were just pulling in to Circular Quay station and the view opened up before me revealing the harbor in all its glory. From the train window I could see the Opera House, the Harbour Bridge, and the multitude of ferries traveling in and out of the wharfs, their passengers enjoying the warm open air and shining sun. This train experience and station continues to be my favorite, each time just as impressive as the last. It’s the little moments that matter in life and I looked forward to reliving this one each time I neared the station. For any Sydney-sider with a day off, the question is not “What do you want to do today?” but rather “Which beach should we go to today?”. Growing up in Florida, I was equally privileged to live in a place where most people dream of vacationing but I did not take advantage of it, did not really enjoy the relaxation that comes with a day at the beach. Now, as a 30-year-old woman who understands the value of relaxation and a vacation, I am happy to say that Sydney turned me into a sufficient beach bum. With a deepening tan and a thirst for adventure, I’ve loved discovering Sydney’s many beautiful beaches. Sydney is all about “what’s on”. From weekend festivals to open-air markets, there’s always something new to do here. Although I was able to tick off the major points on my Sydney bucket list, I know there’s so much more left to see. Looking forward to my return one day to continue the joyous discoveries! A great love letter 🙂 Enjoy your new adventures in “Mel-bin” and NZ! My Ali-girl how I love your blogs and your heartfelt sharing of your time in Sydney.I feel like I am getting to experience Australia along with you! I hope and pray that even greater adventures await you as you continue to travel on. My buddies in Melbourne think their city is even better than Sydney! Love you Ali. Thanks for sharing. Can’t wait to see your NZ story. Be safe. God bless you.